John Mazzara, CFP™ CLU® CHFC® CEBS® MBA MS RICP®, AIF® is a financial planner who specializes in meeting the combined needs of both personal and business planning. His comprehensive background and knowledge of financial services allows him to focus on your whole program and if necessary, coordinate your plan with other professional advisors such as accountants and attorneys. John is the principal partner of Financial Planning Associates. John is a registered investment adviser representative of Cetera Advisors LLC. John holds the CFP™ (CERTIFIED FINANCIAL PLANNER™), CLU® (Chartered Life Underwriter®), CHFC® (Chartered Financial Consultant®), CEBS® (Certified Employee Benefits Specialist®), RICP® (Retirement Income Certified Professional®), AIF® (Accredited Investment Fiduciary®) designations. John has also completed the Maters of Science degree in Financial Planning from the College for Financial Planning with an emphasis in Estate Planning. In addition, he has completed an MBA with a concentration in Finance at the University of St. Thomas. John has completed the Mortgage Bankers Association School of Mortgage Banking Courses I, II, and III and is a Certified Mortgage Banker® (CMB®). John also holds licenses such as life and health insurance, property and casualty insurance, a real estate broker's license, general securities (series #7, 63, 65) and is a registered investment adviser representative of Cetera Advisors LLC. For financial services, you can contact John at Financial Planning AssociatesSM, 5201 Duncraig Road, Edina, MN 55436, 952-929-2577 or 612-386-7027, or at john.mazzara@ceteraadvisors.com. Securites and advisory services offered through Cetera Advisors LLC member FINRA/SIPC. Cetera is under separate ownership from any other named entity. Mutual funds, annuities, stocks and other investments available through Cetera Advisors LLC are not insured by the FINRA, SIPC nor are they obligations of or guaranteed by Cetera Advisors LLC or any other affiliated entity. Such investments will fluctuate in value and are subject to investment risks incding loss of some or all of the principal. Financial Planning AssociatesSM and Venture Development Inc. and RE/MAX Results are not affiliated with Cetera Advisors LLC. 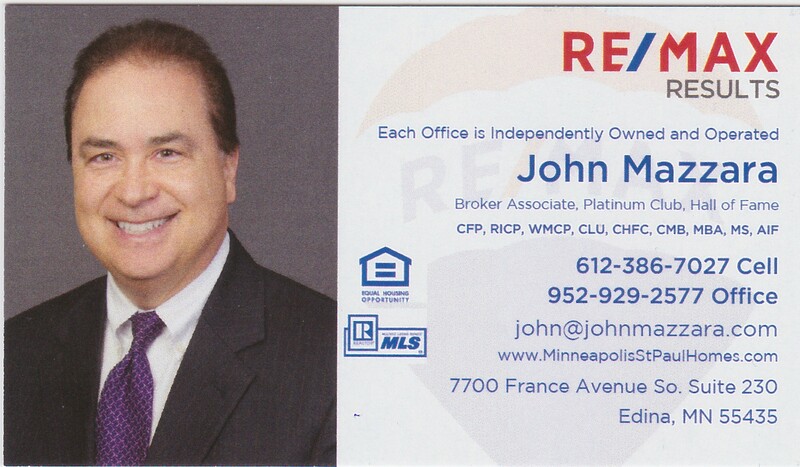 John NMLS # 332556 was the president of Venture Development Inc., a formerly licensed MN mortgage broker. Venture Development Inc. was a broker to some of the largest and most competitive mortgage companies across the United States. Venture Development Inc. specialized in financing for residential, investment, and commercial properties. John can be reached at 952-929-2577 or 612-386-7027 or by emailing john@johnmazzara.com. John Mazzara is a licensed REALTOR®and has been in the real estate business since 1986. He has completed over 1000 transactions. John helps buyers and sellers with their real estate needs regarding homes, investment and commercial properties throughout the Twin Cities. 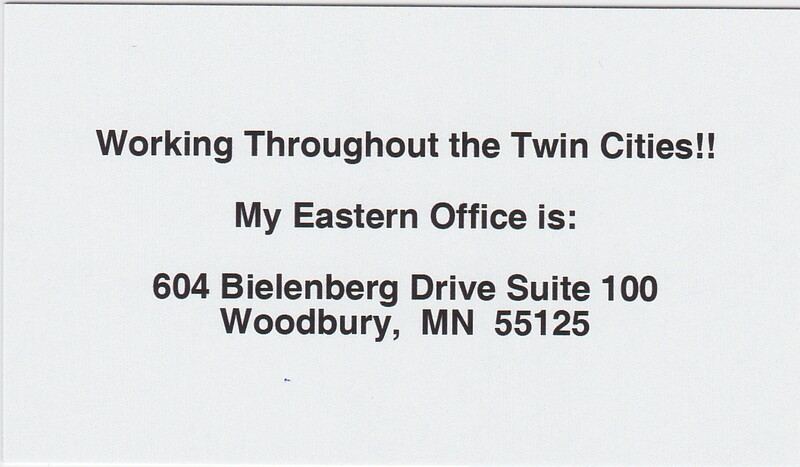 John also is a CRP® (Certified Relocation Professional) from the Worldwide ERC The Workforce Mobility Association helping people and companies moving into and out of the Twin Cities. Ask John how you can obtain a copy of the book he wrote about real estate investing. He is a real estate broker associate with RE/MAX Results, 7700 France Avenue South Suite 230, Edina, Minnesota 55435, (952) 884-8404. Each office independently owned and operated. John can be reached at 952-929-2577 or 612-386-7027 or by emailing john@johnmazzara.com. 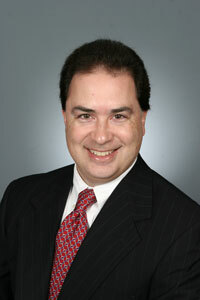 John Mazzara is licensed in Minnesota and Wisconsin. If you are looking to work with a financial professional who will place your interests first then you should call John. The focus of your free initial consultation is to determine goals and objectives. If appropriate, a second meeting is arranged where solutions are recommended. John can be reached at (952) 929-2577 or on his mobile, (612) 386-7027, or by emailing john.mazzara@ceteraadvisors.com. CFP™, CERTIFIED FINANCIAL PLANNER™ are certification marks owned by the Certified Financial Planning Board of Standards, Inc. These marks are awarded to individuals successfully complete the CFP Board's initial and ongoing certification requirements. < John Mazzara holds real estate licenses in Minnesota and Wisconsin.